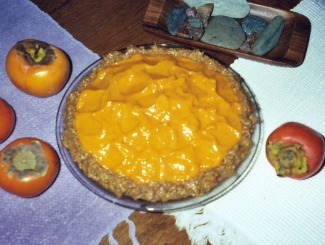 Raw Persimmon Pie is heavenly and one of the most delicious deserts I have ever eaten, perhaps the best. It can take a little tweaking with the ingredients to get the desired consistency you’re looking for, but I found it always tastes great and is fun to make. Cut open the persimmons and remove any seeds. Open the young coconuts pour off the water and reserve. Spoon out the flesh of the coconut into the blender and add the persimmon with about ¼ cup of the coco water and blend. Add more coco water if needed. Add cinnamon to taste if you choose and blend briefly to disperse throughout. Pour out into pie crust and decorate with a sprig of fresh mint. Refrigerate for an hour before serving...if you can wait that long. Making the crust - add the nuts to the food processor and mix until finely chopped. Add pitted dates and coconut and mix until you get a dough like consistency, adding a tablespoon or more of water as needed. Press the dough into an 9 inch pie pan and refrigerate while making the filling. If your crust gets too moist you can add a tablespoon or two of ground chia or flax seeds to tighten it up. I love persimmons, so of course I was attracted to this recipe. In the winter the local trees ripen up and neighbors are eager for me to relieve them of some of their bounty, so I usually stock pile boxes to take me through the winter. This recipe yielded a heavenly pie. Make sure your persimmons are super-soft, like a trembling water balloon.